Dr. Frallicciardi is a graduate of the University of Connecticut School of Medicine and Emergency Medicine Residency. 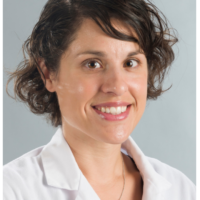 She has served as the Director of EM Simulation and Assistant Residency Director for many years and recently took a position of Director of Simulation for the University of Connecticut School of Medicine and Residencies. When she isn't having a blast in the Emergency Department or simulating with residents and students she enjoys playing with her family, running, skiing or other outdoor activities.